Not one but two flowers opened on my unidentified sea urchin like cactus today! They started opening in the morning and by the time I left my mom's place in the afternoon they were fully open in unison. Here's a photo! I'm so happy that I happened to be around to see them bloom since I call my apartment home and only get to visit once or twice a week. Amending the Soil for the First Time. I made my visit a productive one, and got to relocate my ice cream banana to a drier spot, apply a lot of manure, and apply fertilizer and micronutrients to the garden. This is the first time I've ever really made an effort to amend and fertilize the soil, but I've had a good reason. The biggest pollutant to the St. Johns River is excessive nutrient runoff from people's lawns and gardens, and since I am first and foremost a lover of Florida's nature I had some reservations about "improving the soil any. I ended up changing my mind in this case though, since the runoff naturally and slowly filters through my garden before either reaching the aquifer or becomes connected to the swamp in the rainy season, forming a natural buffer. Most of the pollution is from lawn fertilizer that takes a direct route to the river through the storm sewers. The other reason for adding organic matter is that my soil is very compact, sandy and clayey, which means that its constantly wet, full of nematodes and forces tender plants to keep their roots right at the surface where the cold can more easily kill them. When I dug up my bananas that did not make it I noticed that all the roots were growing straight out across the soil, making the corm look much like an octopus. The roots also had nodules in them showing the work of nematodes, which prefer constantly wet, sandy soil. Adding organic matter makes the soil more breathable too, so then its supersaturated in summer the roots will get a little more oxygen. I also picked up some "Really Great Stuff" from Whole Foods that contains a lot of vitamins, minerals and trace elements that some of my plants desperately need. For example, my gardenia is finally going to flower but its always had anemic looking yellow leaves that will benefit from the iron. 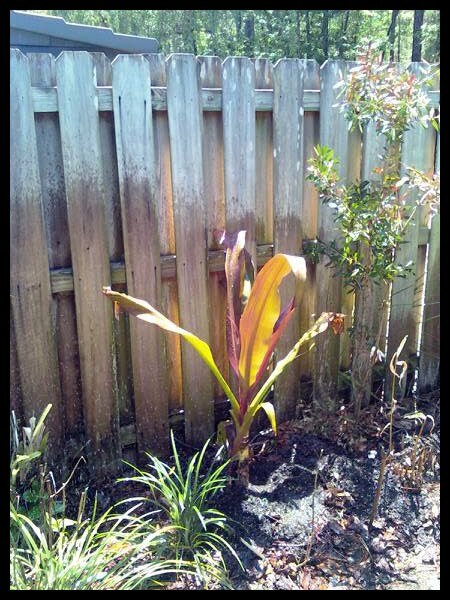 I ended up using it everywhere, but the radicalis palms are really going to benefit from the iron and the bananas need the magnesium. Every time I garden I just can't leave those treefrogs alone! They're just so sweet that I can't take my eyes off them, and the little dudes are easy to find since they tend to pick the same spots for their homes. I would name them but when the rainy season hits I'll have hundreds of them to keep track of so whats the point? I do notice that the squirrel treefrogs like to stick in pairs, and I'll even project human qualities on them by imagining the couples as soulmates in their homes together. See, they're two peas in a pod! 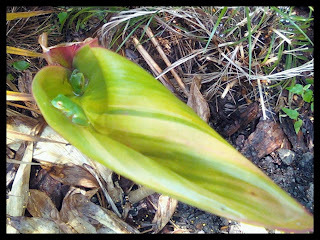 Or at least two frogs in an uncurling ti plant leaf, but that's less allegorical. I would imagine that the close quarters would get to be stifling at times, but I know that Jim here will always come back to Pam by the end of the day. I've always admired these for their foliage and flowers, but they always seemed to be pretty expensive. That is, until I found a huge one in a little pot for ten bucks! It even has a little pup at the base, so it must be mature enough to flower by now. I just love the subtle coloration, like a gradient of bronze, green and lavender. To those of you further south this might not seem like a big deal, but for me this is huge. Swiss Cheese plant is the most tropical plant in my garden and has now survived two record breaking cold winters, possibly the coldest temps it will experience in years. I'm sure that others have overwintered it outdoors in this area before, but I've been hard pressed to find much about it online, in books or by word of mouth. My ti plants are also returning, including my "black magic" specimen that I thought may have been toast. Yup, today was a good and productive day. Cactus flowers always looks so beautiful and delicate, compare the "tough" apprearance of the body :) Love those tree frogs. Vute names for "Jim and Pam" ! Lucky purchase of that queen emma crinum. Wish I could have one... Your garden looks more beautiful everyday! Love your little frogs, and wonderful you seem to have had a complete recovery after your cold spell. We have the same type of soil here, and they say that with all the rain in the wet season, it is best to add compost or fertilizer little and often. Foliar feeding is great as it gets stright into the plants "veins". You are right about the tree frogs. 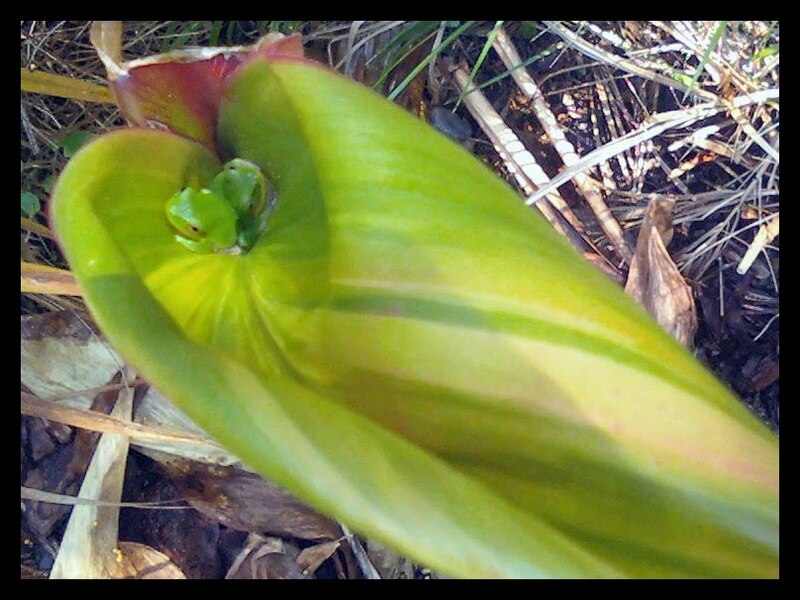 They are easy to find since they seem to adopt a plant as their home. They love the giant birds and ti plants in my garden. Jim and Pam...haha! A fan, huh? I paid $25 for a small 'Queen Emma' bulb about three years ago. It was the cheapest I had ever seen at a nursery. That one bulb has turned into about 25 plants at this point, that I have carefully separated and shared with others...my son, my sister, my mom. One has already reached blooming size and several are very nearly there. Said all this to say their monetary value has gone down in my mind, now that I've discovered how prolific they are. 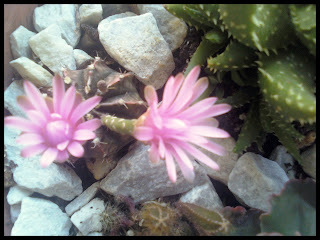 Ami - I love cactus flowers too and first got to know them as a kid when I lived in the Mojave desert. African Aussie - Our gardens seems more similar everyday, apart from the cold winters here that is. Something else I've noticed about the waterlogged soil is that mulch tends to be suffocating in the wet season. I use a diluted orchid fertilizer for my epiphytic plants in summer but will have to try it earlier this year! Floridagirl - Yup, I love the office! Anywho, I'm glad your crinum has been so prolific! How much water does yours get? I'm assuming it will handle waterlogged soil like other crinums but i dunno. So nice to hear that your Monstera and Ti plants are coming back. I am constantly surprised to see what you are able to grow so far in the north of Florida. Great deal on the Queen Emma. She is a beautiful plant. Those cactus flowers are adorable and so are the two little tree frogs. I see they're enjoying the beautiful spring day. My 'Queen Emmas' are in a very dry, poorly-reached-by-the-sprinklers, hungry soil location. Just happened to be where I planted them, in paranoia, because another tree-lily--the green kind, C. asiaticum, had rotted in a waterlogged spot I had placed it just a year earlier. 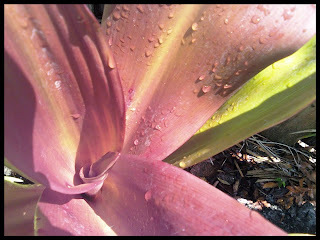 I since have planted another of those on a dry slope...you know what I mean...dry and well-drained as Florida goes. I do have the smaller crinums growing in varied conditions, including quite dry and quite wet locations. Cactus flowers i like due they bright colors and delicateness, i liked the picture of two cute tree frog too.